The objective of this bulletin is to provide detailed guidance for sizing rupture discs using standard methodologies found in ASME Section VIII Div. 1, API RP520, and Crane TP-410. To assist in the sizing process, contact Flow-Tech at 410-666-3200 for help. 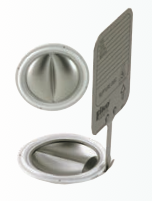 Rupture Disc Sizing Bulletin by Fike from Flow-Tech, Inc.
A wastewater treatment plant that serves 1,800 households includes several mechanical and biological wastewater treatment facilities. The mechanical treatment consists of a screening system and an aerated circular grit trap. The biological treatment is carried out in a combi-tank (biological treatment stage outside, secondary clarifier-settler basin inside). The plant also includes facilities for the removal of nitrogen which is carried out by intermittent nitrification/denitrification. In addition, the plant also has a static sludge thickener. 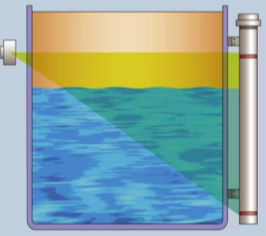 The activated sludge, which has been formed in the biological treatment stage through the growth of microorganisms, slowly separates via gravity in the secondary clarifier basin. A portion of the activated sludge is fed back into the biological treatment stage as return sludge and mixed with the newly added nutrient-rich wastewater. The amount of return sludge should always be in a defined ratio to the current feed quantity. For this reason, the flow rate of the recirculation pipeline has to be measured. 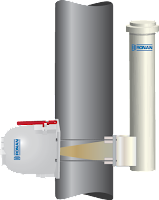 The installation of a wetted magnetic-inductive flowmeter, which is very common in the water and wastewater industry, would have required modifications to the piping and subsequent expensive civil engineering work. The only available manhole location on the buried recirculation pipeline has not been suitable for retrofitting a magnetic-inductive flowmeter. Moreover, the pipeline in the manhole is always submerged in water. 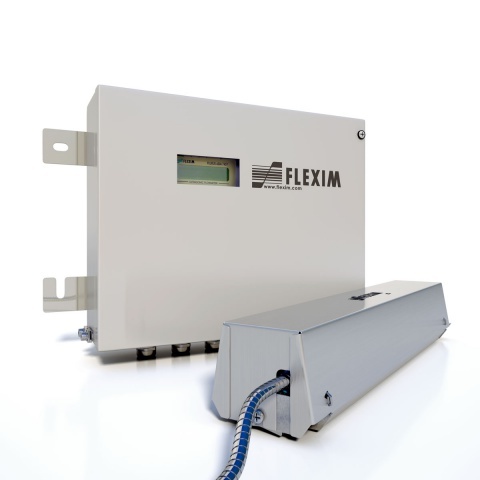 Retrofitting the measurement point with a FLEXIM non-invasive ultrasonic flow meter, including IP68 fully submersible transducers, proved to be a convincingly simple, accurate, reliable and cost effective solution. 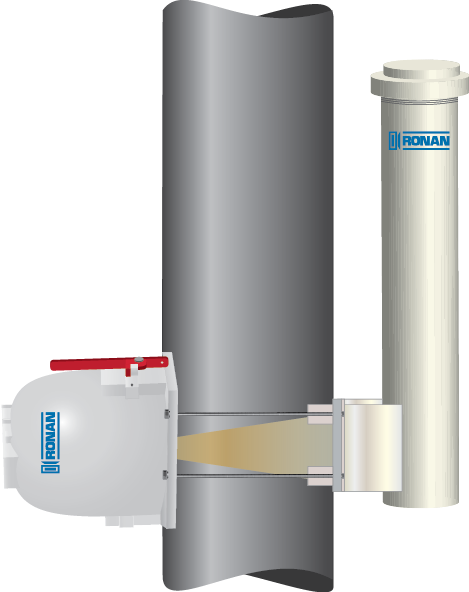 There is no need to open the pipeline when mounting the transducers onto the outside of the pipe and therefore no interruption to operation. The cramped installation point in the flooded shaft does not pose a particular challenge to FLEXIM’s measuring system: the IP68 transducers can be operated while permanently submerged and, since they were installed, they have been providing highly reliable measurements for automatic control of the pumps that convey the return flow quantity of the activated sludge. Measuring pH/ORP is very common, but taking true measurements and correct interpretation of the results is not self-evident. Certain effects can potentially cause problems if not taken into consideration. 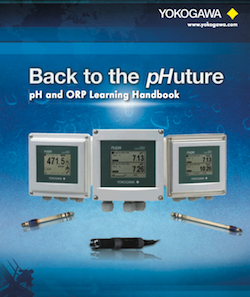 The purpose of this book is to provide a comprehensive understanding of pH/ORP measurement and how to achieve reliable results. Basic information on the principles of measuring pH/ORP, the construction of the sensing elements and their basic use in process applications are provided. A part of achieving accurate and reliable pH/ORP measurements requires sufficient and correct maintenance and storage conditions. Prevention of common errors during maintenance and storage, as well as consistent detection of loop failures is important. This book describes how these can be avoided and how failures can be detected. This book is accompanied with a frequently asked question and answer section as well as an appendix that includes helpful information like a Chemical Compatibility Table and a Liquid-Application-Data-Sheet, which can be used to describe the user’s application. You can get your copy of the pH and ORP Learning eBook by visiting this link. 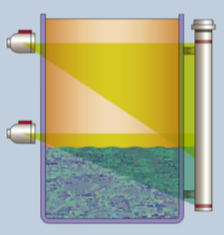 Radiometric level detection, using a very low gamma level source, is designed to deliver outstanding performance in a wide range of difficult applications and process conditions for both liquids and bulk solids which include the most dangerous materials such as caustic, toxic, corrosive, explosive, and carcinogenic irrespective of their viscosity and temperature.